Este artículo analiza las complejas intersecciones entre el conocimiento pedagógico, del contenido y de la tecnología en la formación inicial del profesorado de educación primaria. Las preguntas guía son: ¿Cuáles son los contenidos y procesos de la formación que facilitan en los profesores la construcción de su conocimiento profesional? ¿Qué deberían aprender los profesores en este mundo complejo y cambiante? El estudio se realiza a través de: 1. El análisis del plan de estudios del Grado de Maestro en Educación Primaria y las fichas de las materias en relación a la atención prestada a los diferentes aspectos del desarrollo de la competencia digital y el encuadre de tecnologías que adoptan y 2. Las representaciones del profesorado de la titulación. Se utilizaron análisis de documentos y entrevistas en profundidad. Para el análisis se tuvo en cuenta el proyecto DIGCOMP (Ferrari, 2013), que distingue cinco áreas para la adquisición de la competencia digital: 1. Información, 2. Comunicación, 3. Creación de contenido. 4. Seguridad y 5. Resolución de problemas. Entre los resultados más sobresalientes destaca una perspectiva instrumental de las tecnologías y el dominio de la competencia informacional sobre los otros aspectos que conforman la competencia digital según DIGCOMP. This paper analyzes the complex relationship between pedagogical, content, and technological knowledge in elementary initial teacher education. These are the guide questions: What are the contents and processes that facilitate the education of teachers when building their professional knowledge? What should teachers learn in this complex and changing world? The study is carried out by the analysis of: 1. The initial teacher education curriculum and the skills integrated in each subject. 2. The representations of the degree faculty. Document analysis and deep interviews were used. DIGCOMP project (Ferrari, 2013), which identifies five areas for the acquisition of digital competence, was taken into account. These areas are: 1. Information; 2. Communication; 3. Content creation; 4. Security; 5. Problem resolution. Among the most outstanding results it is highlighted an instrumental view of technology and the prevalence of information skills over other aspects of the digital competency according DIGCOMP. 1. Los autores/as conservan los derechos de autor y ceden a la revista el derecho de la primera publicación, con el trabajo registrado con la licencia Creative Commons Reconocimiento-NoComercial-SinObraDerivada 4.0 International (CC BY-NC-ND), que permite a terceros utilizar lo publicado siempre que mencionen la autoría del trabajo y a la primera publicación en esta revista. 2. Los autores/as pueden realizar otros acuerdos contractuales independientes y adicionales para la distribución no exclusiva de la versión del artículo publicado en esta revista (p. ej., incluirlo en un repositorio institucional o publicarlo en un libro) siempre que indiquen claramente que el trabajo se publicó por primera vez en esta revista. 3. Se permite y recomienda a los autores/as a publicar su trabajo en Internet (por ejemplo en páginas institucionales o personales) antes y durante el proceso de revisión y publicación, ya que puede conducir a intercambios productivos y a una mayor y más rápida difusión del trabajo publicado (vea The Effect of Open Access). Ben-Peretz, M. (2011). Teacher knowledge: What is it? How do we uncover it? What are its implications for schooling? Teaching and Teacher Education 27, 3-9. Burbules, N. y Callister, Th. (2001). Educación: riesgos y promesas de las nuevas tecnologías de la educación. México: Granica. Cochran-Smith, M.; Feiman-Nemser, S. & McIntyre, D. J. (Eds.) (2008). Handbook of Research on Teacher Education. Enduring Questions in Changing Contexts. Third Edition. Nueva York: Routledge. Cohen, L.; Manion, L. y Morrison, K. (2011). Research methods in education. London: Routledge. Darling-Hammond, L., & Bransford, J. (2005). Preparing Teachers for a Changing World: What Teachers Should Learn and be Able to Do. San Francisco: Jossey-Bass. Ferrari, A.(2013). DIGCOM: A Framework for Developing and Understanding Digital Competence in Europe. European Comisión. Joint Research Centre. Institute for Prospective Technological Studies. Grant C. (2008). Teacher Capacities: knowledge, beliefs, skills, and conmiments. In M. Cochran-Smith, S. Feiman-Nemser y J. McIntyre (Eds.). Handbook of Research on Teacher Education. Enduring Questions in Changing Contexts. Third Edition. (pp.127-200). New York: Routledge. Grossman, P. (1994).Teacher knowledge. In T. Husen & T.N. Postlethwaite (Eds). The international encyclopedia of education (pp. 6117-6122). London: Pergamon Press. Hudson, B., Zgaga, P. & Astrand, B. (2010). Advancing quality cultures in teacher education in Europ: Tensions and Opportunities. Sweden: Umea University. Jenkins, H. (2008). Convergence Culture. La cultura de la convergencia de los medios de comunicación.Barcelona: Paidós Educación. Jenkins, H. (2009). Confronting the challenges of the participatory culture: Media education for the 21st century. Cambridge: MIT Press. Koehler, M. J., Mishra, P., Kereluik, K.; Sin, T. S. & Graham, CH. R. (2014). In J.M. Spector et al. (Eds.). 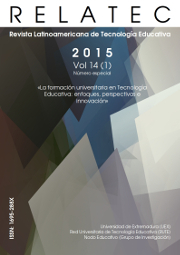 Handbook of Research on Educational Communications and Technology. (pp. 101-111) New York: Springer. Koehler, M.J. & Mishra, P. (2005). What happens when teachers design educational technology? The development of technological pedagogical content knowledge. Journal of Educational Computing Research, 32(2), 131-152. Koehler, M.J. & Mishra, P. (2008). Introducing TCPK. En AACTE (Ed.) Handbook of Technological Pedagogical Content Knowledge (TCPK) for Educators. (pp. 3-30). New York: Routledge. Lankshear, C.; Knobel, M. (2008). Nuevos alfabetismos. Su práctica cotidiana y el aprendizaje en el aula. Madrid: Morata. Mishra, P. & Koehler, M.J. (2006). Technological pedagogical content knowledge: A new framework for teacher knowledge. Teachers College Record, 108 (6), 1017-1054. Montero, L. (2001). La construcción del conocimiento profesional docente. Rosario (Argentina): Homo Sapiens. Munby, H., Russell, T., & Martin, A. K. (2001). Teachers’ knowledge and how it develops. In V. Richardson (Ed.) Handbook of research on teaching (pp. 877-904). Washington, DC: American Educational Research Association. Prensky, M. (2001). Digital Natives, Digital Immigrants. On the Horizon, 9 (5), 1-6. Shulman, L. (1986). Knowledge and Teaching: Foundations of the New Reform. Harvard Educational Review, 57 (1), 1-21. Tardiff, M. (2013). El oficio docente en la actualidad. Perspectivas internacionales y desafíos a futuro. En M. Poggi (Coord.). Políticas docentes: formación, trabajo y desarrollo profesional. (pp. 19-44). Buenos Aires: Instituto Internacional de Planeamiento de la Educación IIPE-Unesco.